Today’s mileage: 87 miles. Total: 921 (!) *ALMOST AT 1000 miles! 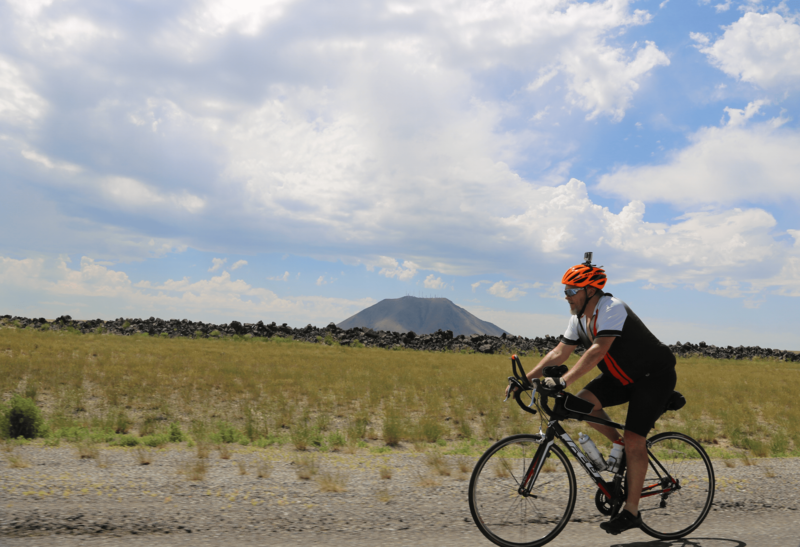 Mark was hot and tired in the high desert between Craters of the Moon to Idaho Falls… but I loved the landscape! 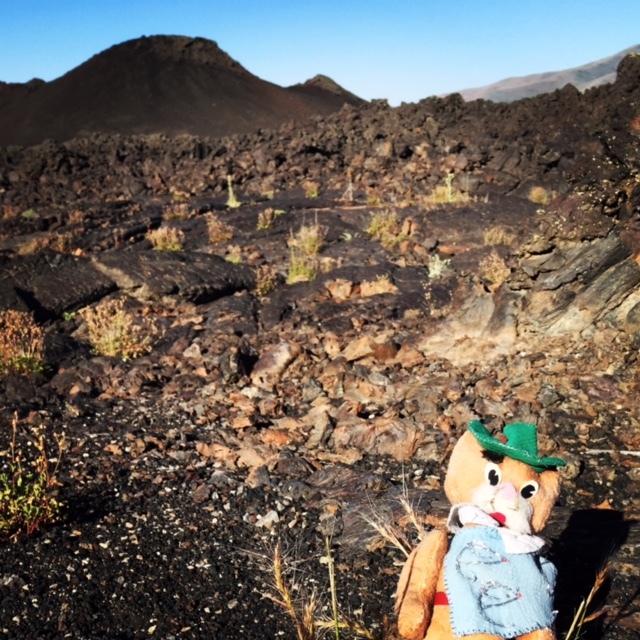 Have you ever wondered what it’s like to be on the moon? Well, wonder no more. 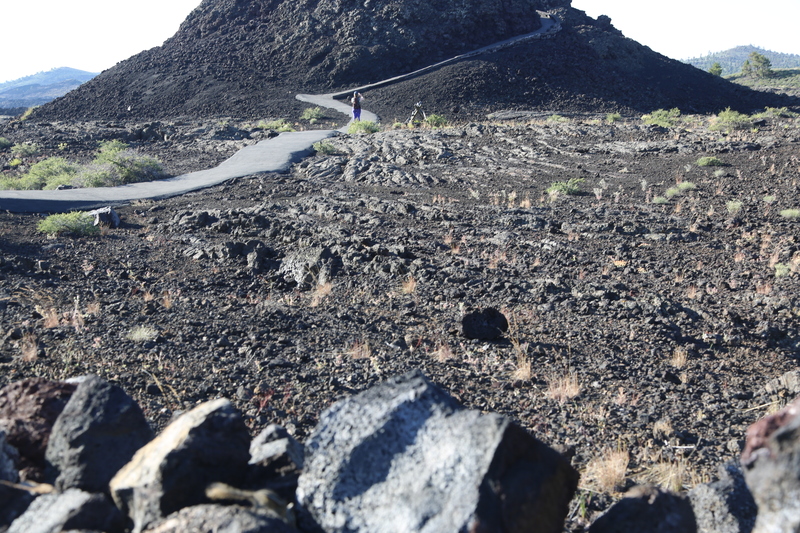 Just go to “Craters of the Moon” in Idaho. Whoa. American astronauts trained here before going to the moon! I had no idea this place even existed, so I spent about an hour checking it out while Mark was biking. Even took a few pics of the doll given to us by one of our former AUBG students there. We promised to show it the world so that’s what we are doing :). After your visit to Craters, you may be passing through Arco– the first community in the world ever to be lit by electricity generated solely by nuclear power (which happened in 1955), be sure to stop at the Pickle’s Place for an Atomic Burger. There you will meet Zane Danz, one of the 2 sons of the owners and the creator of one of the famous spices they use to make all their food, which he did as a senior project in high school! 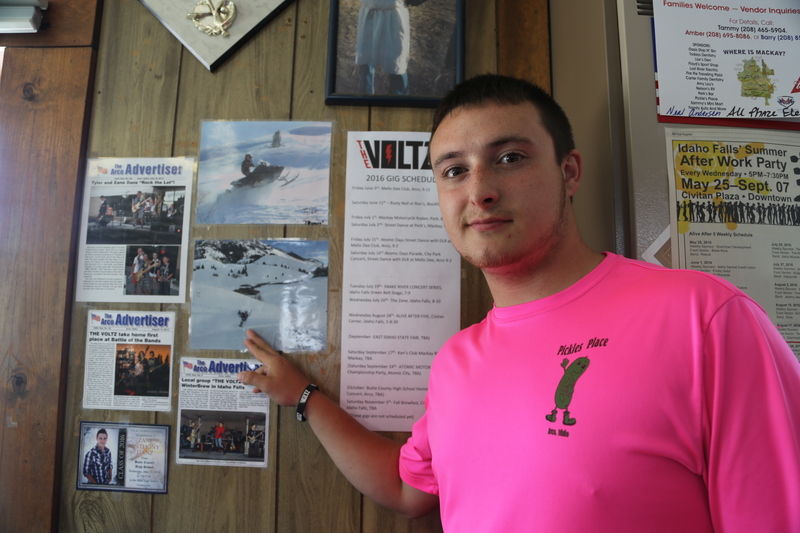 He is also in a band with his younger brother and he is huge fan of “snow machines.” I was not sure what that meant, and he said it is the same thing as a snowmobile- that’s just what they call them up there– and that is what makes him feel most alive. Last year he wound up upside down in a tree and that was a thrilling moment for him! He spends all his spare time snowmobiling when he’s not in the restaurant. His mom didn’t like it too much, but he said it was one of his best memories! One last thing. I am constantly marveling at the lack of chain stores in any of these towns we are going through. Most of the restaurants, motels and shops are all family-owned. Like Pickles Place (above, where Zane works), owned by the same family for 18 years. 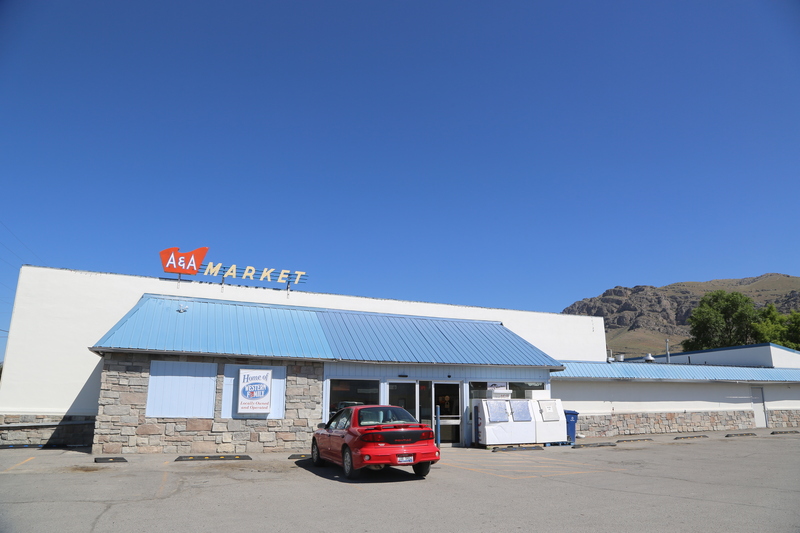 And this grocery store in Arco which looked like it hadn’t been updated inside or outside in decades (including the people who worked in it). I love it. More to come about biking and life tomorrow! No chain stores… love it! But it is a tad sad that you found it to be an exceptional element!